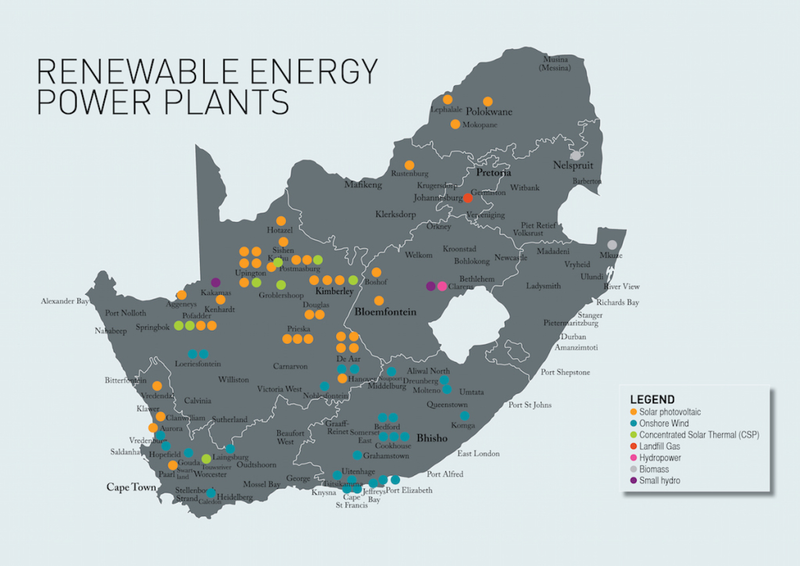 South Africa’s Renewable Energy Independent Power Procurement Programme (REIPPP) is an example of a locally designed and implemented program for enabling increased supply of renewable energy and combating climate change. It has been described as “the most successful public-private partnership in Africa in the last 20 years” and is contributing to the country’s target of producing 7000 MW of renewable energy by 2020 and 17,800 MW by 2030. The REIPPP is a public-procurement program that allows Independent Power Producers (IPPs) to submit competitive bids to design, develop and operate large-scale renewable energy power plants across South Africa. With high levels of sunshine and wind, combined with the wide availability of land, the country is well positioned to take advantage of renewables. To date, 102 IPP projects have been procured from four bidding round windows with further windows expected to be announced in the future. The projects are located across the country and can be seen on the Energy Blog’s interactive map and in the diagram below. They use a variety of renewable energy technologies including biomass, landfill gas, hydro, solar (concentrated solar power (CSP) and photo voltaic) and onshore wind. In addition to helping to increase the supply of renewable energy, which helps to alleviate the energy shortfall the country is currently experiencing, all projects have “been designed so as to also contribute towards socio-economic and environmentally sustainable growth, and to start and stimulate the renewable industry in South Africa” according to the program’s guidelines. This is reflected in the evaluation criteria which ensures each bid is assessed according to price (70% weighting) and other development factors (30%). According to the South African Government News Agency, over eight years REIPPP has attracted ZAR 209.4 billion (approx. USD 14.2 billion) in committed private sector investment into South Africa. 38,701 jobs have been created – many of which have been for youth and women from communities located near the IPP plants – and other educational, health and enterprise benefits have been experienced. Different IPP developments have achieved this in different ways as the three examples below illustrate. The 140 MW Kangnas Wind Farm located in the Nama Khoi Municipal area in the Northern Cape is one example of a renewable energy power plant enabling local socio-economic development. It was part of REIPPP bid window 4 and so was only recently approved. ESI Africa reports that it is expected that the turbine towers for the wind farm will be manufactured locally in a facility located in the Special Economic Zone (SEZ) for Green Technologies near Cape Town that is owned by GRI. Already, this SEZ has resulted in the creation of over 300 jobs and has attracted over ZAR 680 million (approx. USD 47 million) in green technology investments. By 2030, a further ZAR 3.7 billion (approx. USD 252 million) in investments are expected to be attracted and 3,000 jobs created. Furthermore, GRI’s local subsidiary is 25% owned by local black (African) shareholders and its employees have benefited from professional work experience, trainings and being able to learn and transfer new skills to other local employees. Another example is the 50 MW Bokpoort CSP Project, valued at ZAR 5 billion (approx. USD 342 million), also located in the Northern Cape province, and officially opened in early-2016. The plant was expected to generate enough renewable energy to power around 21,000 homes and abate approximately 230,00 tonnes of carbon dioxide from the atmosphere each year but expectations have been exceeded. The Jeffreys Bay Wind Farm produces 138 MW of renewable energy and is located in the Eastern Cape province on a site that spans 3,700 hectares. To date, its developers have invested over ZAR 30 million (approx. USD 2 million) into 20 local socio-economic and enterprise development projects. Of this, over ZAR 2 million (approx. USD 140,000) has been invested into their Renewable Energy Scholarship Fund (RESF) to support aspiring engineering students “from around the country to acquire the qualifications and skills demanded by [the budding renewable energy] sector, particularly in the field of mechatronics.” Covering tuition, daily living expenses and learning expenses, scholarship winners can attend one of six universities around the country. Another specific example of their commitment to socio-economic development has been their ZAR 515,000 (approx. USD 35,000) donation to the Mpendulo Savings non-profit organisation. The funds have been used to strengthen “the economic resilience of vulnerable families and marginalised communities through savings groups in the Eastern Cape.” Mpendulo Savings supports its members (of whom 85% are women) by helping them to begin and/or increase saving on regular basis through savings groups and providing them with specialised financial education and business trainings. 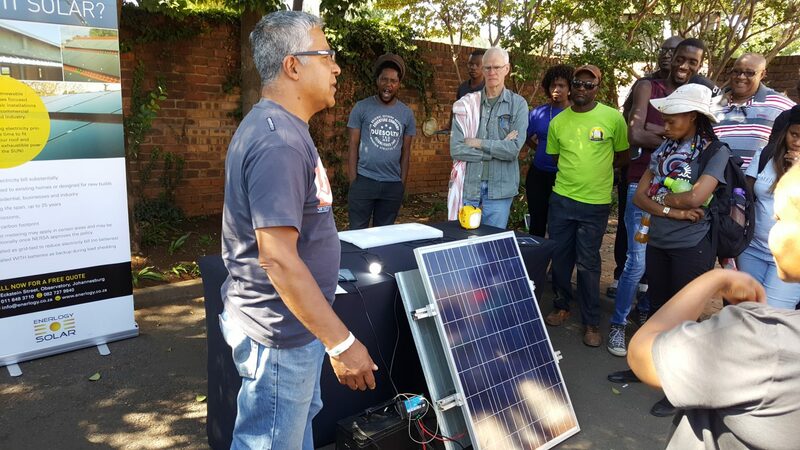 The examples above illustrate different ways in which socio-economic and enterprise development benefits can be delivered to local – and often marginalised – communities across South Africa while also generating new renewable energy supplies. While it is simple to measure the output of a renewable energy plant it can be more difficult to measure the precise impact and extent of these development benefits. REIPPP has shown to the world that South Africa is capable of designing and implementing its own innovative program which not only reflects the need to generate more renewable energy but also strives to address a range of the developmental challenges its people currently experience through a range of programs and initiatives. Image courtesy of Flickr. Originally published by S&S on April 2, 2019.